I start the day looking for another place to stay. All of the hotels on the main street are full (Friday night). I try the losmens in the narrow alleys, but they are also full. 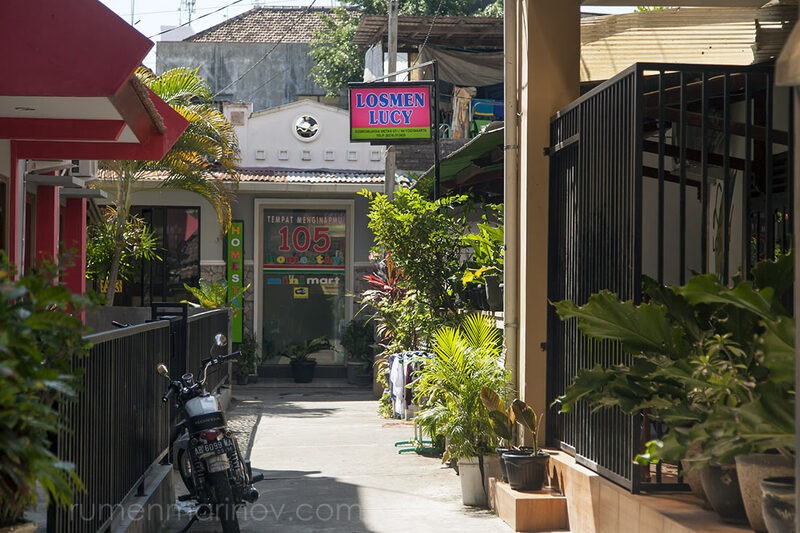 I finally come closer to Malioboro Street, walking in a lane called Gang 1 and a losmen with the name Lucy catches my eye. I am a lucky man – Losmen Lucy has air-conditioned room for 150 000r, much cleaner and much nicer than the one at Losmen Anugerah Jaya. What a massive difference $5 dollars can make! I pay immediately for two nights and run quickly to bring my bag from that horrible place. The guy there is extremely apologetic about the noisy guests last night and doesn’t demand a payment for the night. Nevertheless I give him 100 000r, happy to escape. 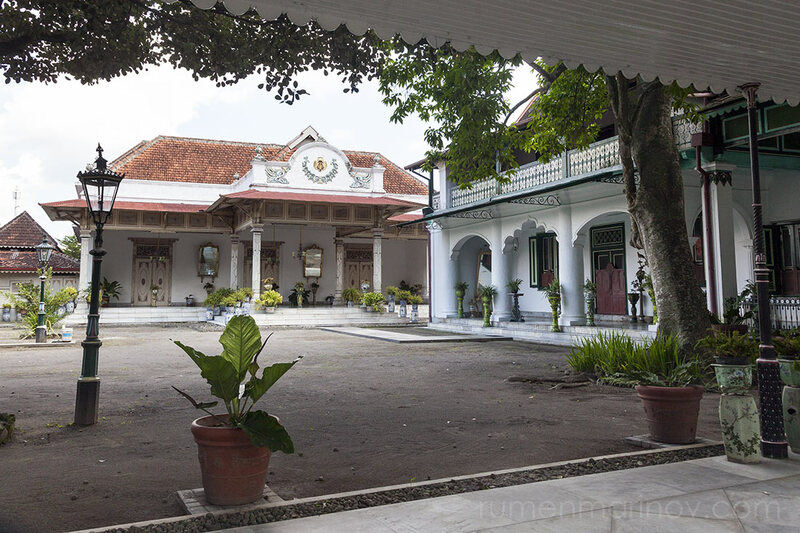 After resolving the accommodation issue, I feel very happy and relaxed to explore Jogja. 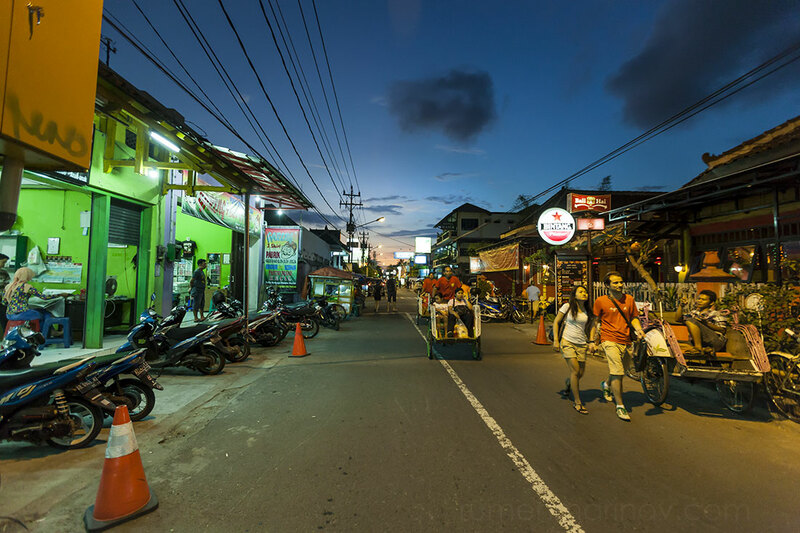 I decide to walk along Malioboro Street and see where I will get. 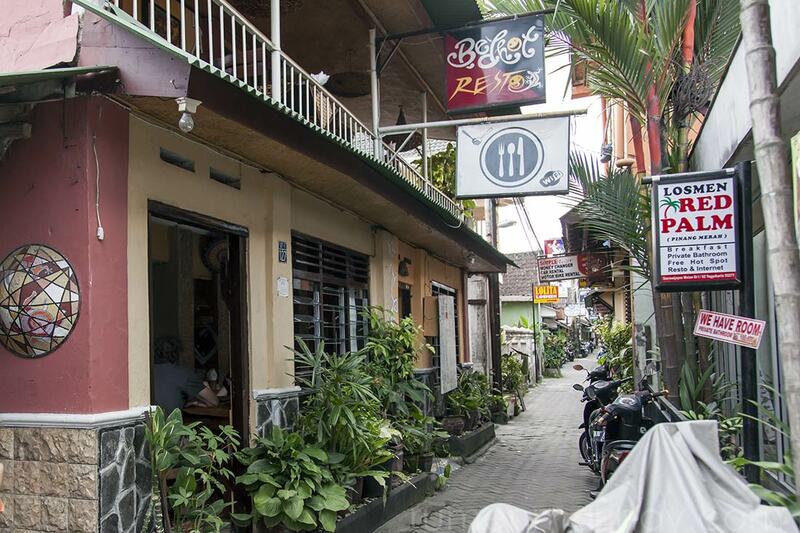 Jogja is dynamic and yet relaxed and easy. I often stop to observe interesting people, shops or a photoshoot where a few aspiring photographers work with two models. I walk a lot and don’t realize how I get to the Sultan’s Palace. 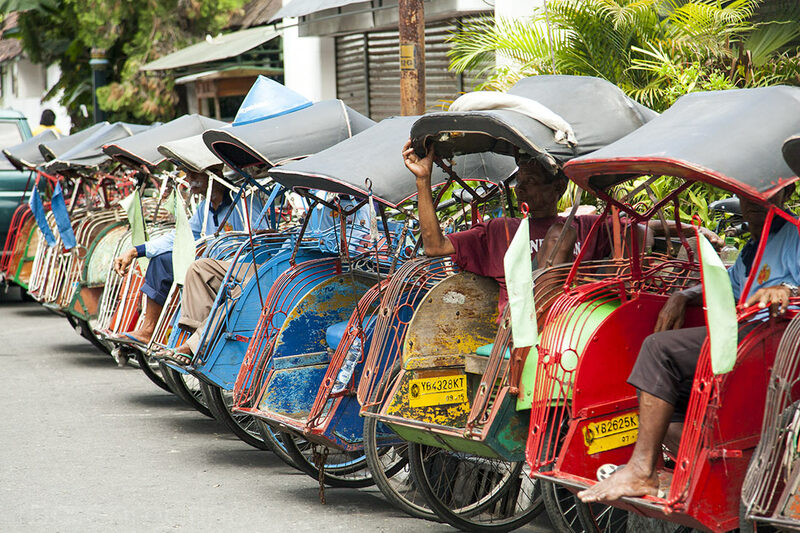 Numerous velo-rickshaws a willing to take me any where, but today I prefer to walk. I watch a photo shoot. A photographer giving instructions to one of the models. 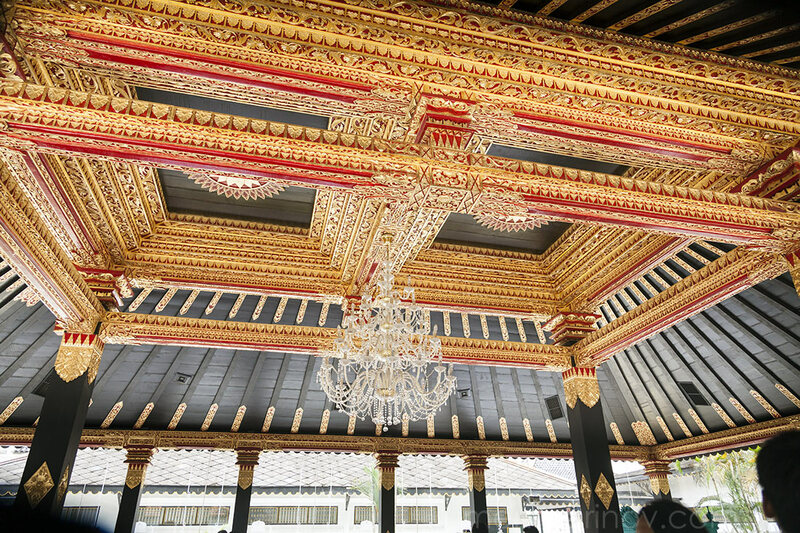 The Sultan still lives here and the section of the palace open for visitors is interesting. 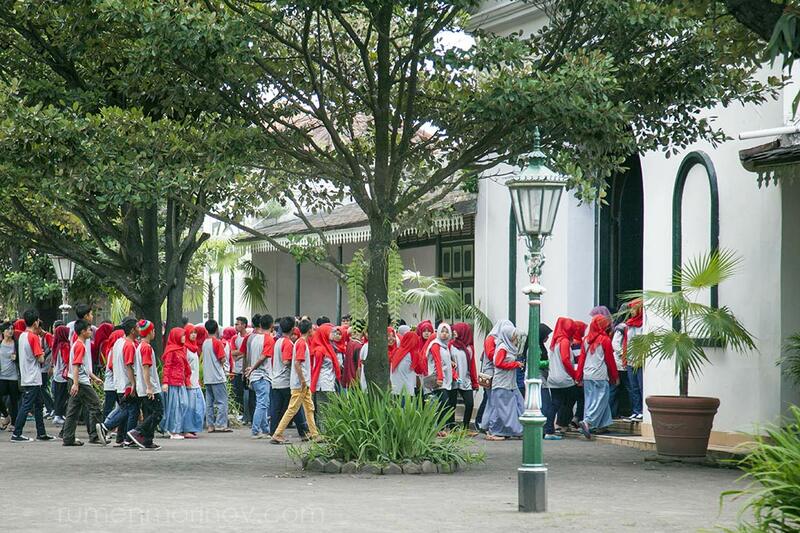 Even more interesting for me is to observe the numerous groups of school children visiting the palace. They all wear very clean, freshly pressed uniforms with different bright colours indicating (I guess) what school they come from. I note how respectful and well behaved these children are, but still playful. 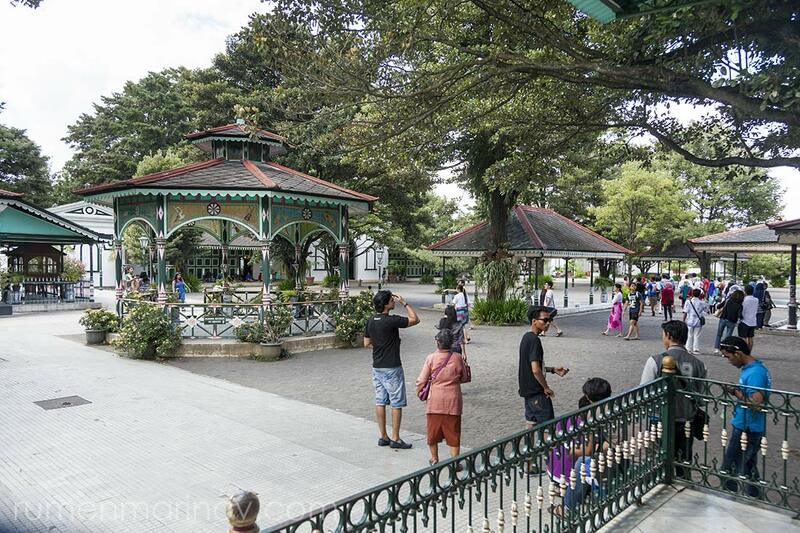 Around the palace you can find many large, shaded and well ornamented marble platforms used most likely for social occasions. Even in the top heat of the day they remain airy and cool. 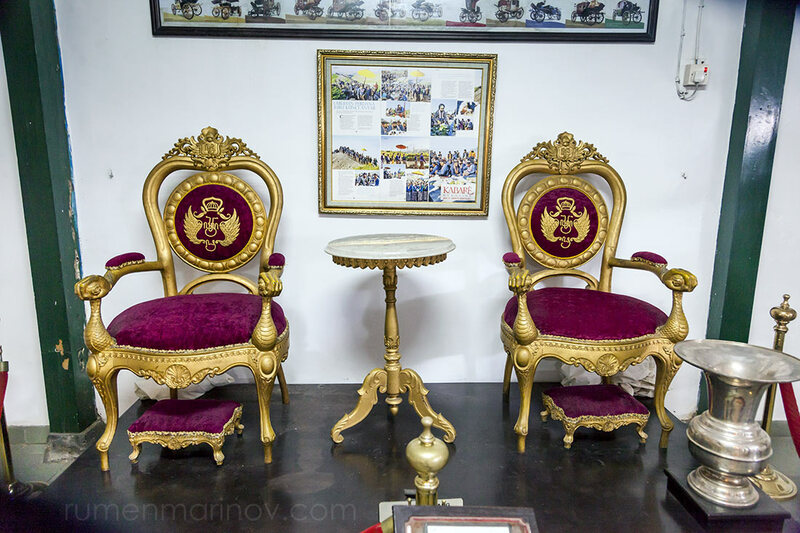 Looking at the platforms I can vividly imagine the sultan sitting there relaxed on hundreds of soft pillows; several naked virgins tickling his toes or blowing comfort air in his face with that feathered device (the name escapes me now) Lucky sultan! One of the inner yards. Schoolchildren visiting the Sultan’s Palace. 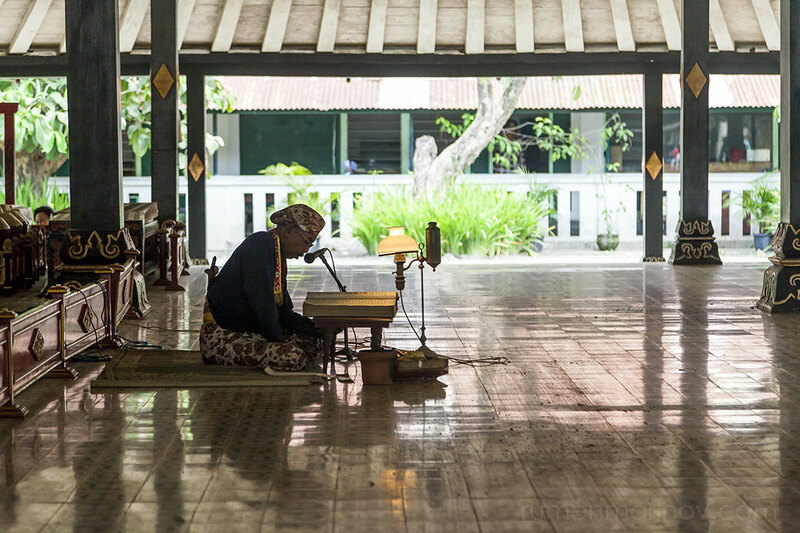 No, this is not the sultan waiting for the naked virgins, but a monk reading religious verses from the Quran. 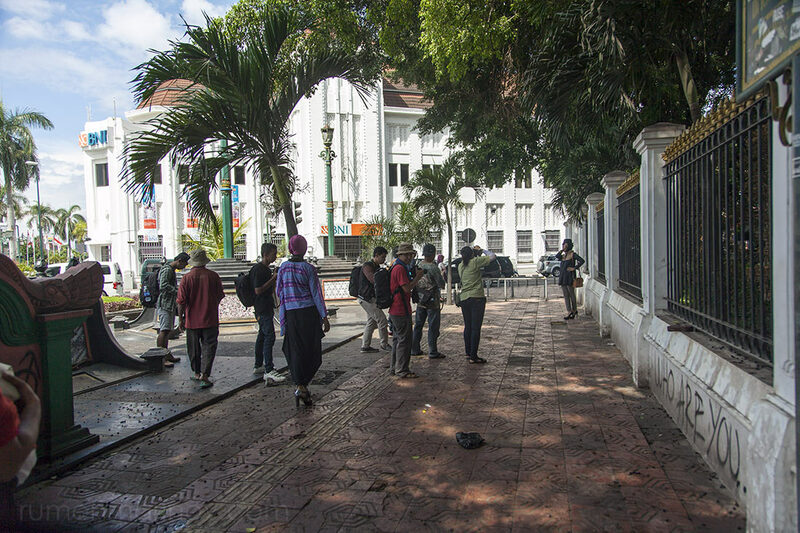 The day is very hot, very hot indeed – I walk all the way to the palace and back getting seriously tired. 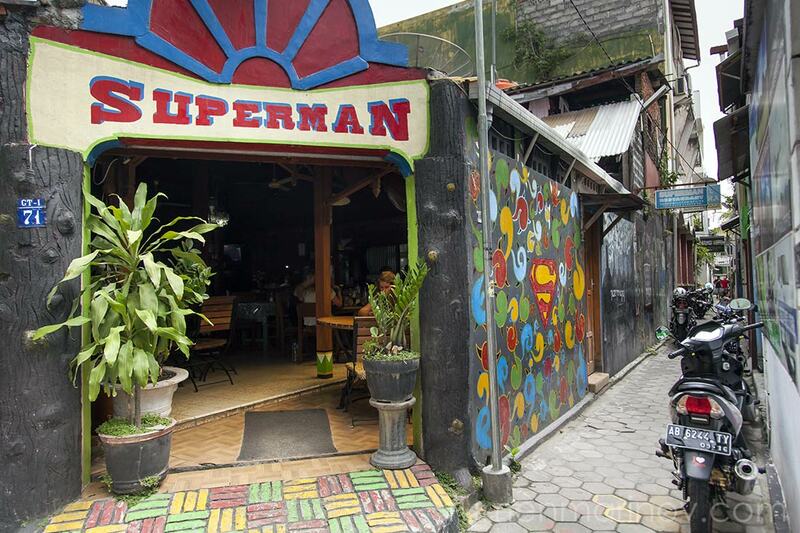 Back at Gang 1 there is a restaurant with the funny name of Superman. 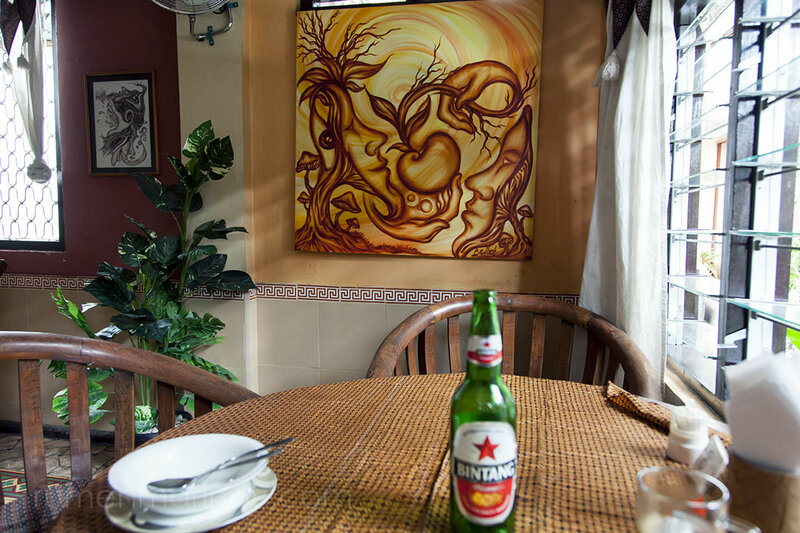 Here I have a nice lunch with one well chilled Bintang beer, which makes me soft and drowsy. Then I catch up with my sleep. God bless losmen Lucy! I emerge refreshed from my room to find that it is already dark. 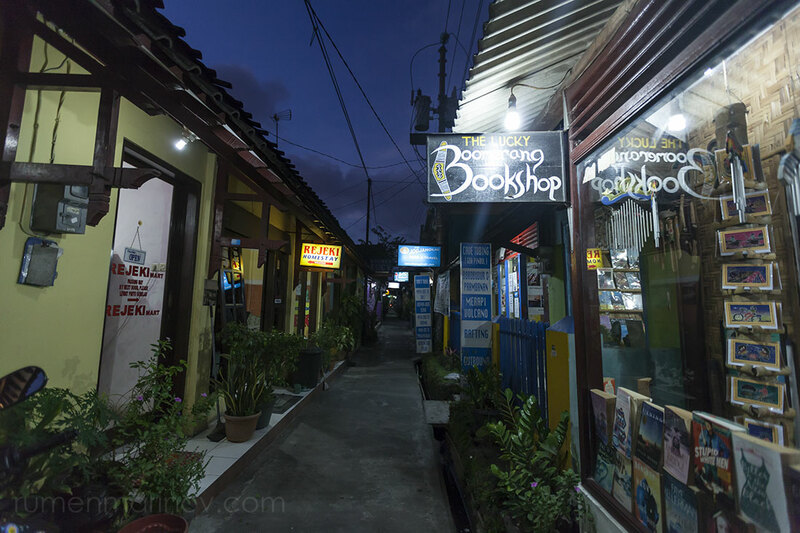 I explore the area around Sosrowijayan Street. 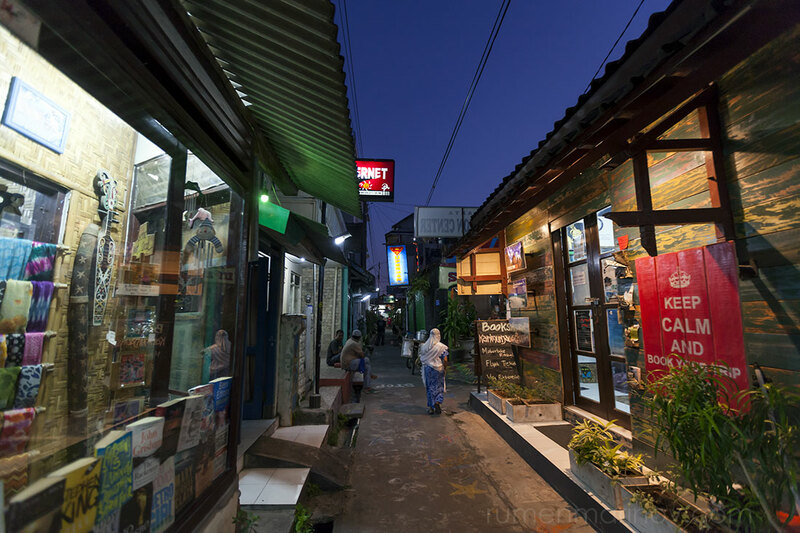 It is a bustling maze of narrow lanes, full of losmens, tourist shops and restaurants. 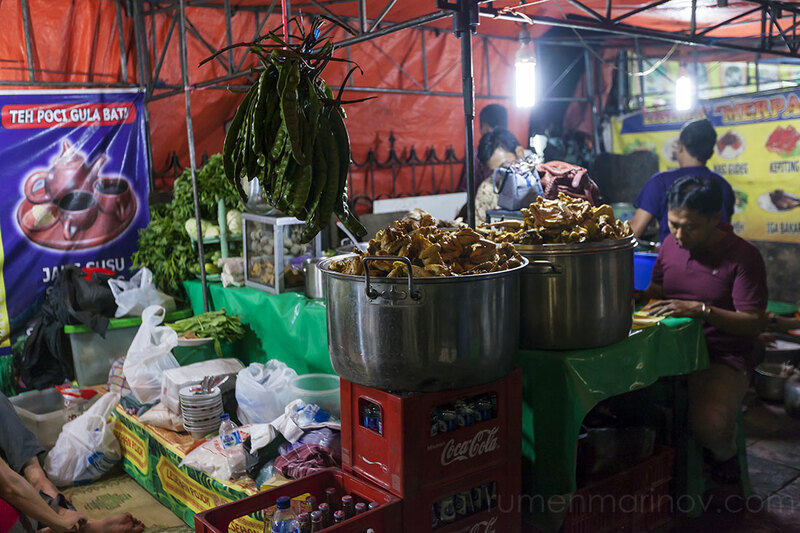 I am looking for a local specialty called Gudeg, a sweet jackfruit stew, boiled for hours in coconut milk and palm sugar. The tourist restaurants don’t have it, but one of the waiters direct me to a local eatery. Unfortunately they have run out of their Gudeg now and invite me to try it tomorrow. 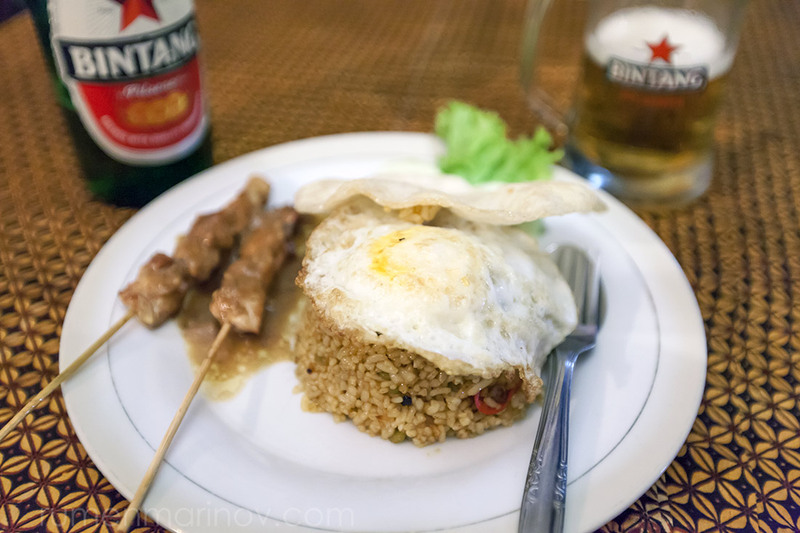 So I complete the day at Bedhot Resto with their specialty Nasgor Bedhot – a dish combining fried rice with mushrooms, prawns and chillies, fried egg, salad and a couple of chicken skewers dipped in sate sauce. It is really delicious! 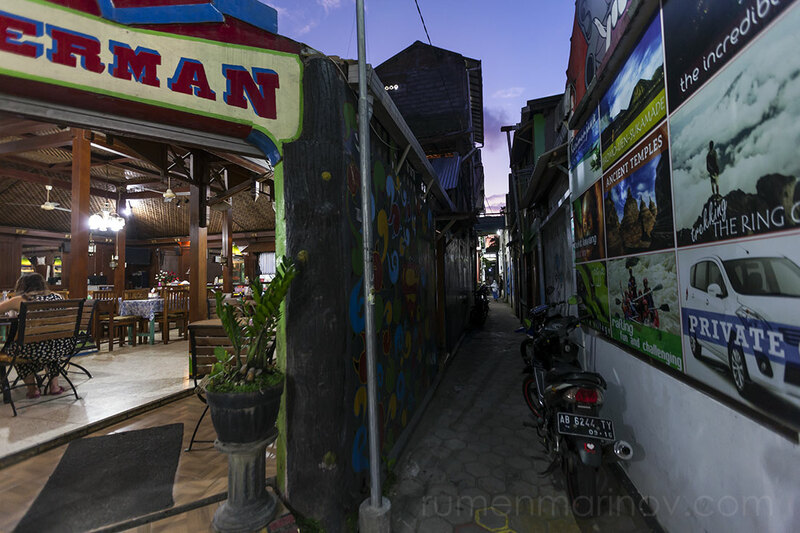 I explore Sosrowijayan Street looking for gudeg, but the eatery where they serve it have run out of gudeg for the day. A lot of fried chicken, but no gudeg. 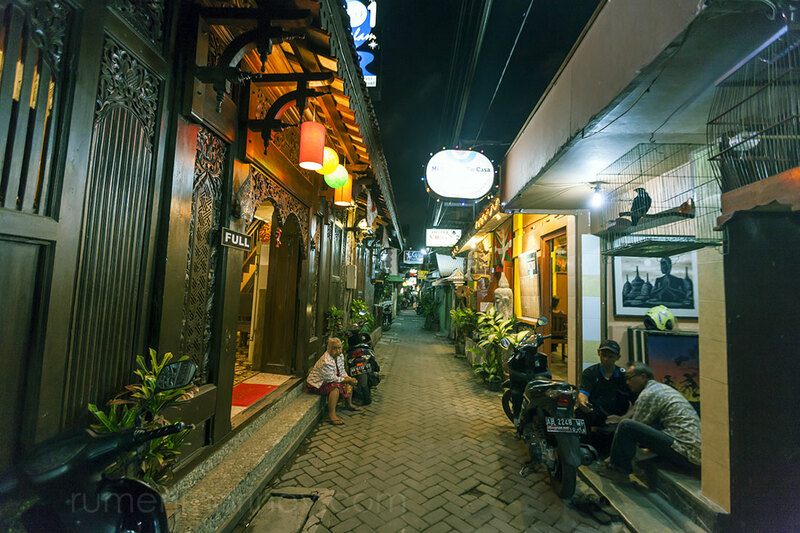 The little lanes around Sosrowijayan Street. Reastaurant Superman is now empty and I don’t feel like dining here. This is Bedhot Resto (a photo from the next day). The interior of Bedhot Resto (also a photo from the next day). My Nasgor Bedhot, the specialty of Bedhot Resto. Delicious! At Bedhot Resto I meet a Chinese guy called John (Huang or something similar), one very interesting character from Singapore. He is a true budget traveller and not a pretend budget traveller like me. He has been all around South East Asia twice and is currently following his third long journey. I learn that his sole purpose in life is to continue travel. I am very curious to find out how on earth he supports this travelling lifestyle? The answer is simple – John (Huang) gets back home for a few months; works hard to save a handful of dollars and then go on a shoestring trip until the dollars run out. Well, I’m thinking – he is still young; there is no wife, no children and no mortgage to worry about. Simple yes, but for how long? At some point we are joined by a young German couple (forgot their names), who share our table, as the restaurant is fully packed. I am happy to use my few German words and entertain my new friends with the story about my misfortunate night at Losmen Anugerah Jaya and it triggers everyone to tell their own similar stories. 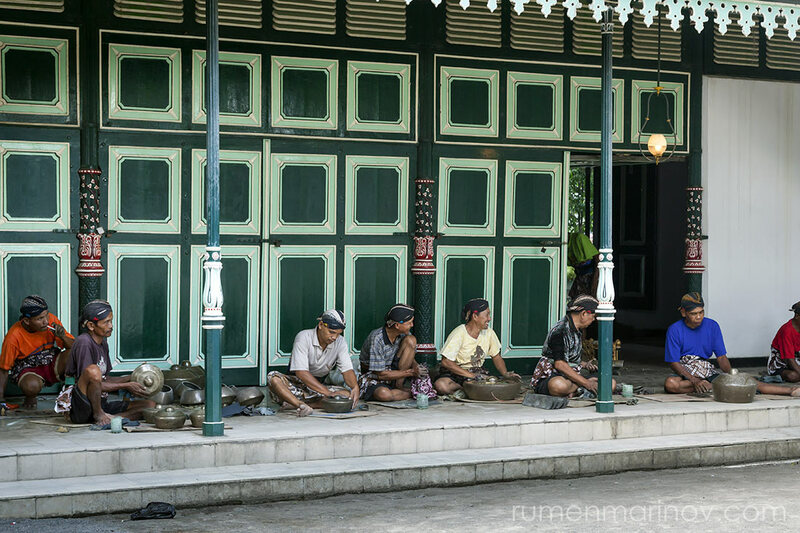 John (Huang) explains the noisy men phenomena – they are Muslims coming from nearby villages. Propriety imposed by Islam doesn’t let them drink alcohol in their village, so from time to time they go to town, where being unseen and anonymous they can break the rules for a while. We chat for a while longer. 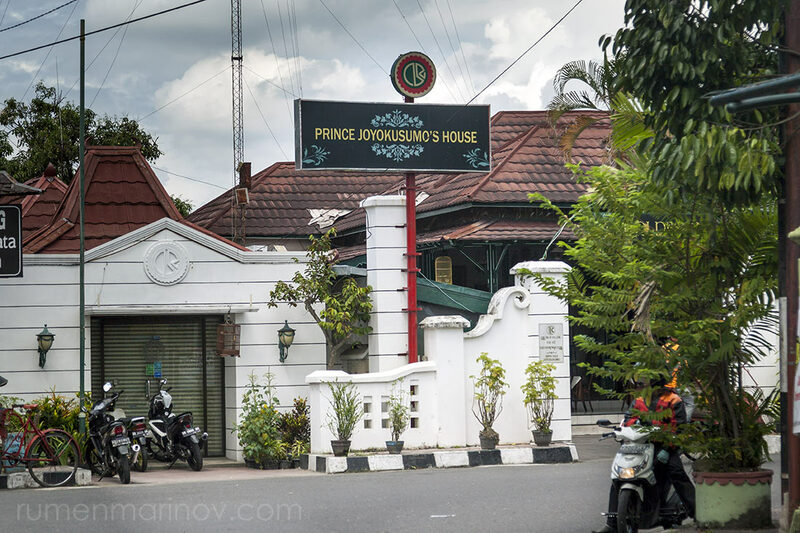 From the German guys I learn a few tips for visiting Prambanan as that’s my plan for tomorrow. 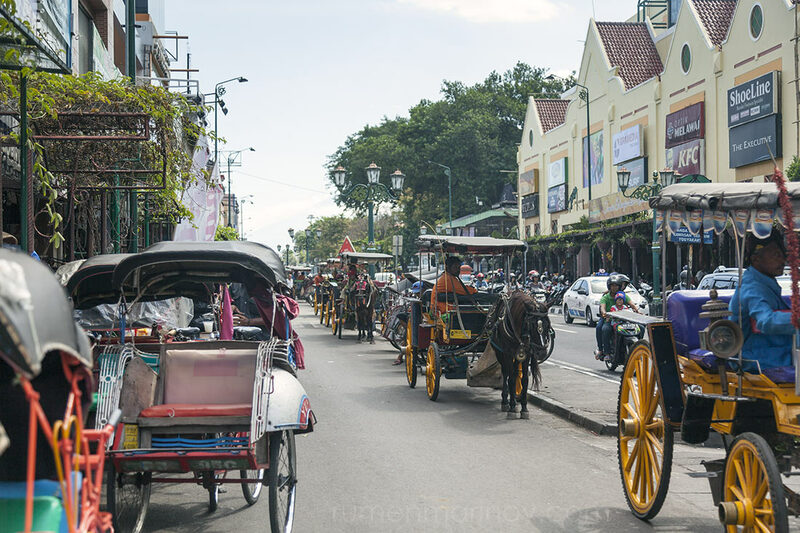 From Jogja they are headed to Bali, while John (Huang) is going to Cemoro Lawang to see the famous Mount Bromo. In my plan I will follow him in a few days’ time. I hope to meet him again; John (Huang) is a nice guy, very easy to be with. I say farewell to my new friends and head back to the lovely (and very quiet) losmen Lucy. What a wonderful day. On the way to Losmen Lucy. 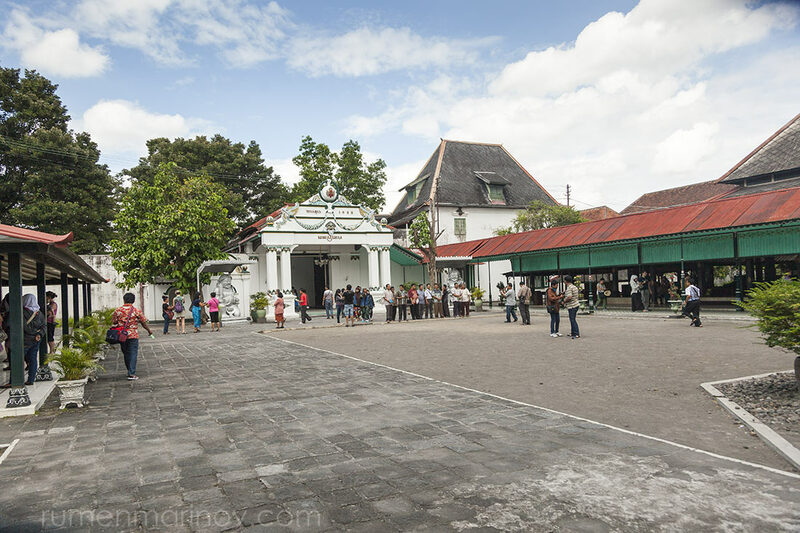 Stay with me dear friends, tomorrow I will visit the ancient temple at Prambanan.